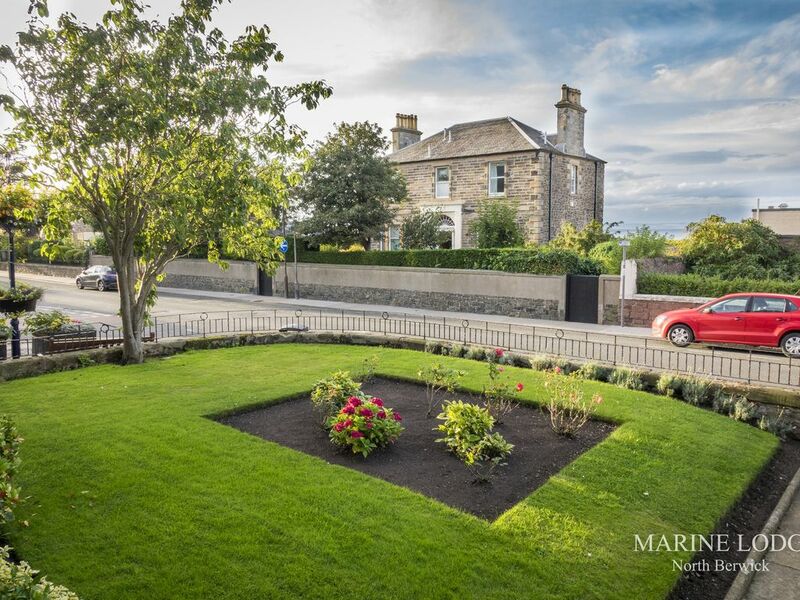 Parked outside on Westgate, North Berwick or to the rear in reserved parking, walk up the path between two manicured lawns to enter the imposing large ground floor apartment through its impressive traditional central doorway. Ground floor of a beautiful and impressive house provides hotel level comfort & ease, and literally the best possible location for golfers: 200 m walk to the North Berwick West Links clubhouse, 50-200m to cafes, restaurants and shops to the other direction. Superb check-in and communication. Welcome ! Now kick off boots, beach or golf shoes in the porch and proceed into the bright, large hallway. Meet & Greet: We make your arrival that little bit more comfortable by providing a selection of welcoming refreshments including Nespresso Coffee, instant coffee and tea supply Scottish shortbread - all with our compliments. We greet you personally conducting a detailed tour to show you around and how the facilities & amenities work. Similarly, all shampoos, conditioners, bodywash and handwashes are supplied with Cole & Lewis latest range - now back to the description of the apartment.... we have just introduced new bathrobes for our guests also during their stay. First left is the airy master bedroom with bedroom two just beyond. Both bedrooms are very spacious, with high cornices lovingly furnished with super king size zip & link beds. Right of the hallway awaits a warm, Victorian period sitting room with fire and large bay window offering Firth of Forth sea views - Beautifully furnished & has three settees & large TV. A stunning crystal chandelier hangs from the original ceiling rose. Yes - there's Wi-Fi too ! Bathroom 2:- Additional new Wet Room with state-of-the-art 'playtime' overhead bridge shower, and separate hose. - Additional separate small sun room for relaxation. Private Rear Courtyard Garden & Bar-B-Q:- To the rear - your own small private,sunny, south facing patio. Here enjoy a BBQ with your friends during the Open. Ideal for all East Lothian's finest golf links, from North Berwick West Links to Muirfield, venue for 2013 British Open Golf, just 4 miles from Muirfield's first tee, this is a recent New Rental Opportunity to Holiday-Rentals in North Berwick. We have furnished and equipped the apartment to the very highest standards and specification in contemporary style. Professionally decorated and designed in a fully coordinated neutral palette. Now , if you've dropped off your luggage from the front, simply drive around the back to your own private parking area. Nearest Restaurant: Orangery, Westgate Gallery and Poonthai, High Street - both 100 yards away. Nearest Bar/Pub: North Berwick - Nether Abbey to Blenheim Hotel, Quarterdeck & Golfers Rest. All within 1 km. Nearest Leisure Centre/ Swiomming Pool: North Berwick & Marine Hotel. Nearest Ski: Edinburgh 35km (Hillend). Nearest City : Edinburgh 30km. North Berwick West Links First Tee - approx. 250 yards away. All restaurants: Nether Abbey Hotel to Osteria & The Grange. Car: useful & recommended, but certainly not essential. East Lothian Golf: The entire area is immersed in golf history. From Longniddry to Luffness, Gullane, Muirfield and Renaissance and Archerfield and of course the North Berwick East and the famous North Berwick West Links. Youngsters can enjoy summer competitions on the Childrens Course or Ladies Links in front of The Marine Hotel. Situated within the seabird centre is an educational centre,restaurant and gift shop. From here you can arrange boat trips to view the gannets and puffins on the Bass Rock and the other islands - Craigleith, Lamb & Fidra. In addition to gorgeous beaches, water sports and sailing , there are some of the best links golf courses in the world within 10 minutes of the apartment including Muirfield, host the 2013 open golf championships in Gullane. North Berwick West Links has become a firm favourite for Winter Golf too - especially from Scandinavia & Germany - and enjoys golfing visitors regularly from throughout Europe including Sweden, Denmark and Norway in particular. The apartment is ideal for golfers - perfectly located and equipped with new storage for golf equipment. Cycling - hire bikes locally. For Cycling you can hire bikes from Law Cycles - just down the high street see David for rates. North Berwick has a vibrant high street with numerous cafes and restaurants catering for every taste whether it be traditional fish and chips, Thai, Italian, Chinese or Indian. In North Berwick great food can be enjoyed at No 12 Quality Street, The Nether Abbey Hotel, The Grand and The Marine. For special occassions try nearby Greywalls (chez roux) and awarded restaurant of the year 2011. Greywalls Hotel has welcomed all the top golfers - from Arnold Palmer and Jack Nicklaus to Nick Faldo and severiano Ballesteros. In Dirleton (2 miles away). The Open Arms locally either eating in its Bistro or Library. (Early dining rates also available). The Castle - great Scottish pub fayre. Central Edinburgh is only a 35 minute car journey from North Berwick. Alternatively take a train leaving hourly from nearby North Berwick station to the centre of Edinburgh at Waverley station. Edinburgh too has great historic sites from The Castle to Hollyrood Palace at the foot of The Royal Mile. Edinburgh of course has some superb restaurants and great theatre, art, culture and museums. If staying in August try a visit to the Edinburgh festival. North Berwick also has its own festival by the sea in August just down from the apartment.. Historical sites: Two 'must sees' are:- Tantallon Castle (built by 1st Earl of Douglass in 14th century) anmd Dirleton Castle (fortress built in 13th century). Walks: Yellow Craig to Gullane Beach, Pointgarry Beach to Westerdunes, West Bay Beach to Harbour; East (Milsey Bay) Beach to Daisy Island past the Armchair rock. Sea Trips: Take 'Sula' to and around the Bass Rock. More recently:- outside Dunbar, 14km away, Fox lake Adventures aims to provide a wake boarding lake with plans for mountain biking at a later date. Marine Lodge will provide you with a great central base to follow all your chosen pursuits, hobbies and sight seeing activities in a timeless peaceful location where nostalgic memories are often created. Large Storage Room: Ideal for all sports equipment and beach items. Private Car Park at Rear with secure rear private access. Mad Swim on January 1st (Annual). Joanna & Andrew love North Berwick , its beaches and golf. Andrew spent his happy childhood holidays in North Berwick and 50 years later the couple still, attracted to its unique charm, were able to return to invest in this glorious Victorian property. When it came on the market the location & opportunity were too good to miss ! Based in the North West of England, Joanna is a barrister-at-law and Andrew runs his own business consultancy. Both Andrew & Joanna are keen sportspeople and remain members at North Berwick Golf Club. They love - as you will - the escapism of the area, the outdoors and the proximity to Edinburgh. They aim to ensure you will have a wonderful, comfortable stay, and their whole team are driven to make your experience one you will want to repeat. The apartment offers an ideal seaside retreat from a day's golf North Berwick. This Victorian period property was the original Lodge back in the 1860s. It commands a fantastic central location just beyond the High Street near Westgate gallery, some 250 yards from the beach and first tee of the historic North Berwick West Links. Shops, Restaurants and tradional Scottish bars and transport links are just a short walk away. The owners have upgraded and developed this grand apartment to provide and equip it with the modern amenities most saught after by holiday renters eg. Wi-Fi, IPOD docking station, DVDs & TVs in 3 rooms, Dishwasher, American Fridge Freezer and Washing Machine & Dryer. They continue to develop the property and in early 2013 created an additional bathroom, to provide guests with spacious shower area and additional storeage. Now boasting a 12kw Multi-fuel Stove fire, with a stylish wet room. It also has new additional storage "golf-locker-style" facilities. Winter time is ideal for Golf Parties from Northern Europe and Scandinavia - including Germany, Sweden, Norway, Denmark & Finland as only a short walk from the first tee on the Historic West Links. Year on year our US clients continue to return and with the advantageous value of the $ dollar versus the £GBP sterling, we look forward to being able to welcome even more visitors from the USA. Latest Review:- Ground floor of a beautiful and impressive house provides hotel level comfort & ease, and literally the best possible location for golfers: 200 m walk to the North Berwick West Links clubhouse, 50-200m to cafes, restaurants and shops to the other direction. Superb check-in and communication. You will be welcomed by Gordon on arrival who will immediately give you the warmest of Scottish greetings as he explains the layout and all amenities to you. In addition to the beautiful furnishings the property is especially comfortable and can adapt to all ranges of holiday visitors. Ideal for couples, families and golfing groups. Bedrooms have superking-size split n link beds and there are 2 additional double bed settees. Guests can enjoy private parking and may choose to enjoy a glass of wine in their own private sun garden at the rear. Unique property features have been retained: - High Ceilings, Victorian period cornices, large spacious hallway and kitchen. Tasteful furnishings of beautiful lighting and chandeliers - enjoy fabulous pictures of golfing and local area scenes as they blend contrastingly with more contemporary Vitriani paintings and sea-scape bedroom pictures. - Combines successfully the 'old & the new':- - Wi-Fi throughout - Superb state of the art wet room - All Appliances (American fridge freezer, dishwasher, washing machine, tumble dryer - Dining for 6 - IPOD - Multi-Fuel Stove (beautiful & very powerful). - some wood supplied. - Private Car Parking Space at Rear. The feeling of comfort means a true home from home. From the time you enter through the porch you have a unique feeling of warmth and space. toilet, combination tub/shower, Hot Grohe shower and heater in bathroom too. Original Iron Bath with contemporary Grohe Shower. Just across from Bedrooms at End of Hallway. Beautifully tiled. Wetroom has underfloor heating and contemporary state of the art finish and lighting. Dec 2012 Traditional style Wood Stove 12kw added. Some wood supplied. On Entry: All What's On / Amenity brochures Nespresso coffee machine and frother. IPOD Docking Station & Radio Alarm 3 x TVs 4 way toaster (great for golfers of course) Tumble dryer Washing Machine Dishwasher Amrican Fridge Freezer Wi-Fi throughout. 2 x Superkingsize Split & Link Beds in each bedroom 2 x Double Bed Settees. Great Porch for Storing Shoes. Storeroom: Large storeroom houses Hi-Chair, Cot and 2 extra single beds. Additional Linen in Storeroom. Tennis rackets & Tennis Balls. The property was very clean and of high quality. very spacious high quality accommodation. THE HOST Andrew and his team were very welcoming and ensured our stay was very comfortable. They even provided a few essentials which was a very nice touch. Answering all questions very efficiently. Would definitely visit again. Location was perfect and a sea view . North Berwick is definitely worth a visit we came with 3 children 13, 7, and 6 and the children were able to play on the beach everyday . Location of the property is perfect. Delighted with these lovely remarks from this Manchester family. So pleased they thought both our service and apartment was what they had hoped. We look forward very much to their return. Staying at Marine lodge was the best choice in our minds. From the time we booked it, Andrew was always on hand to answer questions and provide tips on the local area. Upon arrival we were given a warm and very happy welcome by Gordon, he was also happy to answer any questions we had whilst staying. The apartment itself is of a very high standard of finish and fully equipped throughout. We loved the fridge! All the rooms are of large proportions which gave the four of us plenty of room to relax. North Berwick itself provided us with a good selection of eateries from fine dining to food pub food and also a well serviced town when it comes to supermarkets. Suffice to say that Marine lodge should be your choice as it will be ours the next time we visit North Berwick. Delighted with this great review - highlighting why the apartment proves to be popular with golfers throughout the year into Winter and Easter. It emphasises the spaciousness of the apartment for golfers and their clubs. We look forward to welcoming this group back. Marine Lodge is truly fabulous. This was our first visit and nothing disappointed. The apartment is furnished and decorated to a high standard and has so many nice touches. It’s the perfect base for exploring NB. You are within walking distance for everything. Close by are all the shops and restaurants on the high street and you are minutes away from the beach. The massive lounge and front bedroom both have sea views to enjoy. The wood burning stove was great as we visited in January when the weather was really chilly. Andrew and Gordon were superb from start to finish to ensure everything went smoothly. Definitely worth a visit if you are looking for five star accommodation in the heart of NB! We hope to return soon. We are so grateful for this lovely review. These guests have enjoyed a truly memorable Winter break. It has been a pleasure to have them stay. 5 star accomodation in our favourite place! Marine Lodge is a fabulous, spacious apartment which is definitely worth a visit. You will not be disappointed. The owner continually improves and adds to it over the year and it’s so well looked after. This will be our 4th visit over New Year and we have already booked again for 2019. It is so homely with the grand lounge which looks on to the Main Street in North Berwick. Very comfortable couches and a beautiful fireplace with lots of wood to burn, so cosy! There are 2 generous bedrooms with everything you need. The kitchen is very well equipped and is super for entertaining. We even sit in the back porch some evenings, which is rather cold in the winter but such a lovely space looking out in to the garden. We would love to visit in the summer! Thanks for sharing this lovely family home. So pleased this returning family had yet another great New Year at Marine Lodge. Their excellent review highlights the space , comfort and homely feeling. The best compliment we can receive is for a customer or family to return. The fact that they are returning for next year is lovely. We look forward to welcoming them once more. Perfect location for all needs, golf, beach walks and restaurants no need to use the car. Excellent cleanliness and very well maintained, nothing missing, it was home from home. Would we live there? - Yes, and we will return. Delighted to receive this excellent review from this lovely UK couple. It succinctly summarises what the property has to offer. So lovely also to hear that these guests went as far as to say they could live there too. We very much look forward to their return. Home from home luxury. Visited many times, never disappointed. Kitchen improvements including TV greatly appreciated. Will be back soon. Great weather for late October. So pleased that these regular repeat guests enjoyed the improvements and changes made. North Berwick continues to deliver great weather at end of October and we look forward to their return. In Westgate, North Berwick just 250 to 300 metres from the beach, this impressive Golf & Beach Ground Floor Apartment is superbly positioned in the picturesque seaside town of North Berwick, the gem of Scotland's beautiful East Lothian coastline. North Berwick, once known as the Biarritz of the North, has been a favoured and fashionable holiday destination since the 19th century. Today, sea and beach lovers continue to enjoy its glorious water and beaches and golfers its historic links. The simple fact is once experienced we all return to North Berwick one day. Brimming with history and unrivaled coastal scenery, North Berwick has it all:- from golden sand beaches to ancient kirks, tales of witchcraft and 14th and 13th century castles - Tantallon and Dirleton respectively - to world renowned seabird wildlife attractions - the Seabird centre and of course the seabird home at volcanic Bass Rock. Oh, did we mention the golf ? The beautiful golf & beach house apartment which is centrally located on Westgate, just beyond the High Street is a mere hop, skip and a jump from the West Beach and the First Tee of famous, historic North Berwick West Links. Enjoy views of the sea by Craig Leith and watch golfers warm up on the practice chipping area next to the West Links first tee. The striking apartment is a great location for all sports enthusiasts:- cyclists, surfers, yachtsmen, golfers, tennis players and fishermen. East Lothian Tennis tournament 22nd to 28th July. Also a great location and short 10 minute walk to those attending weddings at The Macdonald Marine Hotel. It is also a great place to stay for long Winter weekends for Golf and International Rugby matches, held at nearby Murrayfield, Edinburgh, where Scotland plays. In 2015 it provided a Great seaside retreat and ideal base for the Scottish Open Golf at Gullane 4 miles away. All well known amenities are within a short walk :- the Seabird centre, the old harbour, the beaches and the high street with its many shops, cafes and restaurants. North Berwick has hosted national sailing championships frequently in several classes, whilst the West Putting Green is a firm family favourite, and a 'must do' on your list. On the doorstep of North Berwick's West Links and, around the corner, walk to the nearby West Putting Green signaled by a statue of the famous Ben Sayers. Just a stone's throw from Westgate Gallery with its Orangery restaurant and cafe, it's again a short walk to North Berwick Railway station. As the main bus stop at Abbey Church is also approx. 200 yards away, the apartment is ideal for Edinburgh and all travel destinations. The Victorian built spacious lodge is furnished to a very high spec. and is great for golfers, beach lovers and Edinburgh itself. Plenty of restaurants to enjoy just down the high street. Choose a range of international cuisine - from Italian to Chinese to Indian and Thai restaurants, not forgetting great Scottish fayre. Golfers staying here have have easy access to not only both North Berwick courses, but Archerfield, Renaissance, Gullane and of course Muirfield, the British Open Golf venue. Tennis enthusiasts and players can play in the National Tennis Championships every June/ July and Sailing Championships. North Berwick also enjoys one of the driest climates in Scotland. It has its own micro-climate. It can be rain in Edinburgh and blue sky in North Berwick. With its pure fresh air, you are guaranteed to eat and sleep well. Welcome: We make your arrival that little bit more comfortable by providing a selection of traditionally Scottish foods - including porridge, oatcakes, cheeses, shortvread and Scottish Tea. We then Greet you personally conducting a detailed tour to show you around and how the facilities work. We provide you with a Welcome Pack, -Fi and a fabulous roaring real fire and your comfort is complete with Cole & Lewis complete soap and shampoo ranges.